Why dance on a floor when you can dance on a cloud! EXCLUSIVE to Radio Pro DJ's - Our "Dancing On A Cloud"(tm) effect. 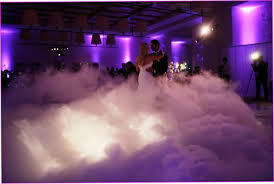 This is NOT a fog machine but a dry ice powered cloud effect. It stays low to the ground and will make your first dance a true fantasy! Plus, you can have this same effect for your introductions, last dance or whenever you want to Dance On A Cloud (tm). Call or email us for pricing information.